There are two kinds of people in this world. Those that like marzipan and those that would well, rather not. Not me though, I love the stuff. I mourn the shift in wedding cultures that don’t seem to have the traditional densely fruited cake covered in marzipan any longer. For me, it was the highlight of a wedding. How can they serve a carrot cake or chocolate mud instead I ask you? Oh how? I still can’t quite put my finger on why I like marzipan. It’s a textural thing, kind of gritty and ever so slightly medicinal tasting. There’s just something about it that just quietly whispers to me. As I don’t seem to be going to many marzipan laden fruit cake filled weddings at the moment, I have to find my fix somewhere else. That’s where stollen steps in. It had been awhile since I had made it last, three years to be exact, and quite frankly it was time to give it another crack. To begin with, soak the dried fruit in the amaretto overnight. 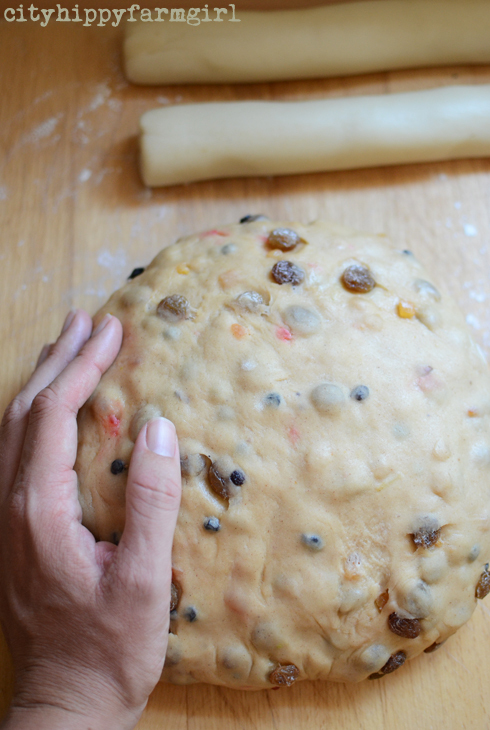 The following day, mix the dough- add starter, soaked fruit, flour, sugar, spices, butter, eggs, lemon zest and water. (Go slowly on the water, the amount you’ll need will vary depending on your dried fruit, flour and starter. Mix the dough for about 8 minutes on a low speed. Allow to prove for about an hour and then give the dough a quick fold. Prove again for several hours. Meanwhile divide marzipan in two and roll into a log of about 20cm long. For the dough, divide it in half, slightly flattening with finger tips to make a rough rectangle. Place marzipan in the middle and roll it up within the dough. Place on a tray, cover with a plastic bag to create a humid environment and allow to prove for another couple of hours. Preheat oven and bake at 180C for approximately 45 minutes, or until golden. 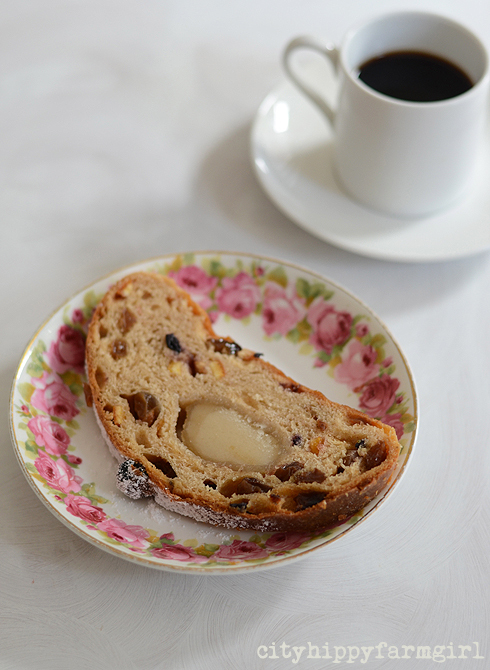 When out of the oven and still hot, brush with 100g of extra melted butter between the two stollen. Allow to cool and wrap in baking paper oven night, the following day drench the stollen in large amount of sift icing sugar. Serve small slices with excellent coffee and bundles of enthusiasm. 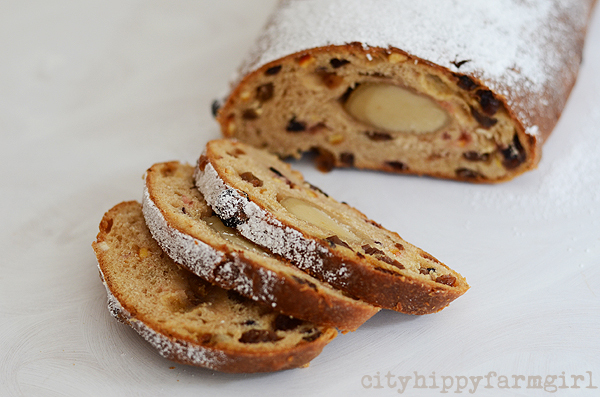 This entry was posted in Baking Bread, Food Glorious Food and tagged bread, Christmas cake, Christmas stollen, dresdner stollen, easy, Germany, recipe, simple christmas cooking, sourdough stollen, stollen, stollen rezept, traditional Christmas cake by cityhippyfarmgirl. Bookmark the permalink. i love marzipan too..and even though i’m not a big dark chocolate fan marzipan covered in it is my favourite chocolate..well..i have two favourites cause i love candied orange peel dipped in it too..
Jane I was thinking of you just recently, wondering if you were making your traditional Christmas cake with your friend? All the cooking you are doing sounds wonderful, an effort, but soooo worth it. This looks great Brydie. Would it be ok without the marzipan or is that unthinkable!? Happy Christmas baking to you, I am making fruit mince pies today and also experimenting with some semi-sourdough baguettes. Oh my goodness Jane, completely unthinkable!!!! Well to me anyway, a lost opportunity for marzipan that is, for all others…completely fine 🙂 Maybe just decrease the baking time a little. I’ll bet those semi sourdough baguettes are delicious. Head north my girl, head north. We can marzipan up. The stollen looks yummy!!! And your pics as always…..gorgeous!!!!!!!!!!!!!!! Looks almost as good as mine ;). I like the addition of amaretto, I’ve not seen that before but it ca only increase almond love! Almost Nick, almost. I see you didnt go for the lump version of it either, (apparently a baby Jesus swaddled and laying in the snow). I did last time I made it but ran with a smooth one this year, a lot easier! I’d certainly be happy being your neighbour. Yep guilty, could never get the taste of marzipan. Even after living in England for three years. And good to hear of another who believes in the healing qualities of almonds. 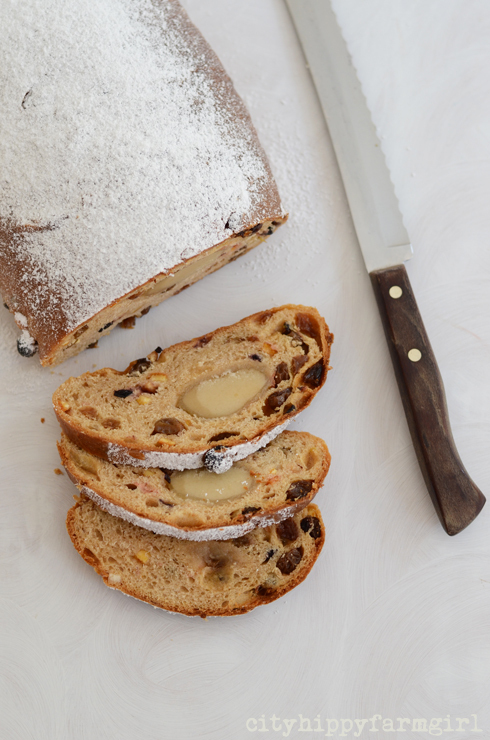 I like marzipan but not the fruit cake it usually tops 😛 However, stollen I have never tried but I think I could like a lot! It looks more like fruit bread than traditional fruit cake, and I love fruit bread 🙂 Plus, cardamom…you can’t go wrong with cardamom. yum, that looks amazing. Thanks for sharing the recipe, must try it out. Home made marzipan sounds like a must make too.